Day 8: Farewell to Vietnam and See you again! + Afternoon we continue to visit the Temple of Literature – Vietnam’s first National University. It was built in 1070 by Ly Emperor which are dedicated to Confucius, sages and scholars. 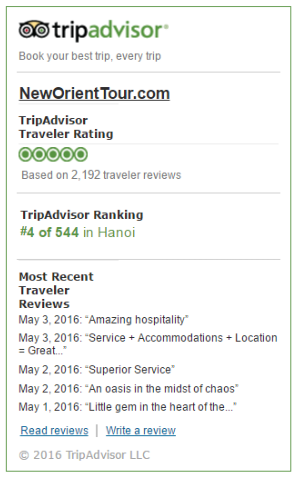 + Walking tour around Hoan Kiem Lake and Ngoc Son temple or Hanoi Old Quarter. + Arrive into Halong Bay at midday and then you will be transferred to a comfortable wooden junk and begin your cruise around majestic Halong Bay. While cruising through the bay, seafood lunch is served on board. + After lunch time, explore limestone caves dotted around the bay, sunbathing on the top deck. + In the evening, chef will prepare a splendid meal with fresh seafood dishes. + Drop you off at the hotel in Hanoi. Next, the driver continues transferring you to the airport and taking flight to Da Nang. + A.M: Have breakfast at hotel. This morning you will make a half day to visit My Son Sanctuary – a cluster of abandoned and partially ruined Hindu temples constructed between the 4th and the 14th century AD by the kings of Champa and have chance to enjoy traditional music. Then back to Hoi An and take a boat trip along Thu Bon river to visit the handicraft village of Thanh Ha Ceramic. You can try to make a small product by yourself. Have lunch at restaurant. + P.M: This afternoon you will wander around old streets to visit Hoi An ancient town including the Japanese Covered Bridge, the beautiful Chinese Assembly Halls, the Phuoc Kien Pagoda, and the local market… At 5.30 pm you will join a cooking class to learn how to cook Vietnamese food under the instruction of cooker teacher. Have dinner with dishes you cook. Overnight in hotel. + A.M: Have breakfast at hotel. The morning is free, you can explore Hoi An on your own, especially by bicycle. The hotel offers bike rentals. Free to have lunch. + P.M: Drive to Da nang and take a flight to Ho Chi Minh City. Before getting to the airport, you stop to visit Cham Museum and Marble Mountain in Da Nang. On arrival Ho Chi Minh the driver picks you up and transfers you to the hotel for check-in. Here you’ll see the hustle and bustle of Vietnamese life everywhere – in the street markets, sidewalk cafes and sleek new restaurants and pubs. Yet within this teeming metropolis are 300 years of timeless traditions and the beauty of an ancient culture. You are free to enjoy your dinner. The remain of the evening is free. + Visiting The Notre Dame Cathedral and Old Post Office, The Reunification Palace, The War Remnants Museum, Ben Thank market. + Taking a sampan cruising along the tributaries of the Mekong River for a close-up view of local life. + Wandering through Islands and orchards where you can taste some of a huge variety of tropical fruits and listening traditional music. + Enjoy your time at leisure. + You will be transferred to the Ho Chi Minh city airport via your schedule flight back home or continue seeing other cities in Vietnam. + We hope you enjoyed your trip and see you again!